Marketers across categories are jumping on the March Madness bandwagon with promotions linked to the NCAA Men’s Basketball Tournament. The tournament got underway Thursday night with the first of the First Round games. It continues tonight with 16 more First Round games. Second round games are Saturday and Sunday with winners moving on to the Sweet 16 on Thursday and Friday. The Elite Eight games are March 24 and 25, the Final Four will be played in Houston on March 31 with the tournament game following on April 2. Wendy’s is partnering with streetwear designer Don C and providing fans with unique college basketball-inspired offers. 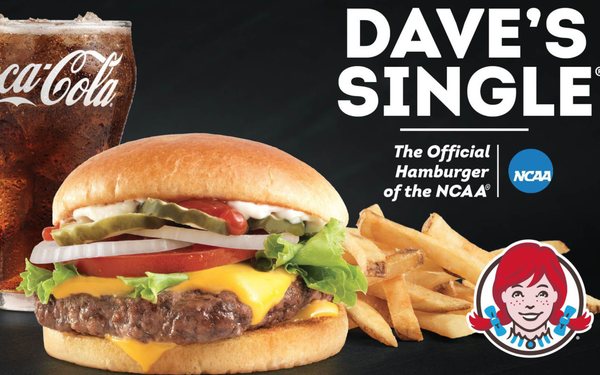 As the Official Hamburger of the NCAA, Wendy’s understands the difficult choices in filling out brackets and wants to take the stress away with “the Easiest Bracket Ever.” Forget having to pick among 32 matchups. Wendy’s fans have two simple options — fresh beef vs. frozen beef. The bracket is an interactive experience that will live on Wendy’s social channels: Facebook, Instagram and Twitter. Content within the experience encourages fans to pick Wendy’s “Team Fresh Beef” and they will be rewarded with perks throughout the tournament. When fans pick Wendy’s as their team and download the Wendy’s app, they will receive exclusive offers each week. Wendy’s has also partnered with luxury sportswear designer, Don C, to launch its first-ever streetwear collaboration. Wendy’s fans will be able to win items from this exclusive collection through giveaways on social media, local stops at regional tournaments and during the Final Four weekend in San Antonio. With games running all day today from 12:15 p.m. until most likely midnight, it’s pretty easy to get distracted from work if you are a basketball fan. Buffalo Wild Wings is trying to entice fans to get out of the office for lunch to catch the games and/or cut out of work early. Billing itself as the “Official Hangout for NCAA March Madness,” Buffalo Wild Wings unveiled a variety of in-restaurant, online and on-site Final Four activations designed to reward fans. Members of the Blazin’ Rewards loyalty program can build a roster of NCAA Men’s basketball teams every time they visit a Buffalo Wild Wings restaurant and receive bonus points every time their teams win throughout the Tournament. Fans can grab fandom by the glass and support their teams throughout the Tournament by purchasing a 4-pack pint glass set featuring the logo of 21 schools on the front, and Buffalo Wild Wings’ logo on the back, for $34.99 (includes shipping). Every order includes a $5 e-gift card and members of the Blazin’ Rewards program earn 100 bonus points with every $10 spent on glassware. In San Antonio, during Fan Fest, attendees can visit the B-Dubs Sports Lounge to watch tournament coverage, attempt a Blazin’ Challenge wing-eating contest and catch appearances by current NCAA college basketball coaches. Powerade — the Official Sports Drink of the NCAA — is kicking off a new brand platform, centered on Power. The new campaign, “That’s Some Kind of Power,” debuted during the First Four March Madness games Thursday. In the coming months, sports fans in the U.S. will see “That’s Some Kind of Power” expand and evolve, with contextually relevant advertisements and activations around iconic sporting events, including the FIFA World Cup™ and Powerade Jam Fest. Developed by Wieden + Kennedy Portland, “That’s Some Kind of Power” is the latest creative iteration of “Power Through” and will be complemented with a full 360-degree suite of online, social, retail and experiential support. Coldwell Banker Real Estate LLC is bringing a new level of madness to tournament brackets. While others agonized over hours of game footage, obsessively checking the Vegas odds and compulsively looking at sports stats, Coldwell Banker used real estate data to fill out its tournament brackets, publishing them on March 13 and calling it Hooptown Bracketology. Hooptown Bracketology leverages a proprietary tool developed by Coldwell Banker to compare real estate data from each school's hometown, or "Hooptown," to select predicted winners of each game. The brand will fill out five different Hooptown brackets: Most Expensive, Most Affordable, Easiest to Move to, Newest and Best for Singles. Ann Arbor, Mich., home of the University of Michigan, was proclaimed as Best Hooptown for Singles. The Most Expensive Hooptown goes to Long Island University-Brooklyn, with the highest residential home-sales price based on 2017 data. The Most Affordable Hooptown is Norman, Okla., home of the University of Oklahoma. The Easiest Hooptown to Move To: Chicago, home of Loyola University, based on the most listings on the market as of Feb. 13. Finally, the Newest Hooptown goes to Durham, N.C., home of Duke University, because it has the newest homes based on the average build-year as of 2017. Finally, last-minute hotel booking app HotelTonight set out to identify which fans are most spontaneous, i.e., most likely to drop everything and travel to see their team play, based on which regions book their hotel rooms latest in the day. The most spontaneous fans are from Indiana, with 48% of fans booking after 6 p.m. during the month of March. Georgia and Arizona were close behind in a tie for second place with 47%. New York, Maryland and Kentucky tied for third place with 45%.